”Music is an universal language” state two Miami Ad School students who alongside Grooveshark (a free music streaming service) put the QR codes project together for fashion brand Diesel. The DSLTAG is meant to bridge the gap between a person’s digital identity and his/her offline one and make sharing one’s musical preferences easier IRW (in the real world). The new digital adventure starts online, on Diesel’s website, where those interested can search and select the music files they want to share, pick a t-shirt model and the corresponding QR code colour & style. And continues offline where the next thing you know is people scanning your shirt. Or so Grooveshark and the students hope. Note that the DSLTAG project isn’t ”live”/”real” yet, this being still a school project imagined by 2 students that obtained Grooveshark’s support. It’s yet to be validated by Diesel if they decide they like it. We could ask ourselves how easy would it be for people to scan one of these codes given the fact that their ”owners” would be moving and in traffic. And how many people do actually know that the QR code is there to scan? 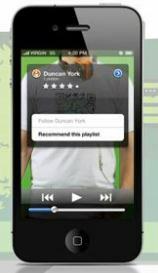 Or will they feel motivated enough to take the effort to scan somebody else’s playlist when they’ve got their own? Whether this eandeavour will make it to the ”real world” or not (in the meanwhile it got nominated at the 2011 edition of Cannes Lion) it just comes to prove that QR codes are turning into an increasingly adopted advertising practice (in line with Kinetic’s forecasts). If you’re looking for more news on QR codes and their integration in an out-of-home environment you might find Tesco’s underground project an interesting one. P.S. I’ve just came across a survey on the usage of QR codes to somehow try to assess the project’s successfulness from a consumer behaviour point of view. The study conducted by ScanLife and cited by the San Francisco Chronicle shows that, as far as the US consumers are concerned, 30%-40% of the surveyed smartphone users have scanned a QR code; the 4th quarter of 2010 seeing a rise of 50% in mobile bar code scanning. At the moment, there are but a few reliable studies on the QR codes usage but my understanding is that the QR codes aren’t yet a highly familiar tool for the average consumer; it’s still a quite geeky thing- more popular in some parts of the world (like US and Japan) and less popular/ known in other. So the DSLTAG project might just be ahead of its time. This entry was posted in Marketing and Advertising and tagged advertising, Chatter by Dynamax. Bookmark the permalink.